Rob Bisbee sees quite an uptick in manufacturers across lower-tiers metalformers seeking out robotics to ease the metalforming process, keeping employees out of harm’s way while boosting productivity in various applications. As senior automation engineer at Greenerd Press & Machine Co., Inc., he’s in a position to know. 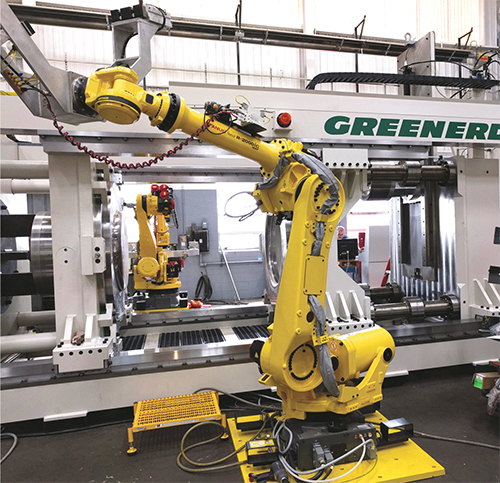 With the Nashua, NH, hydraulic-press provider recently announcing that it has become a Tier One Industrial Authorized Robot System Integrator of automated-equipment manufacturer Fanuc America Corp., Greenerd has full access to Fanuc’s comprehensive roster of robots and related automation. The company has been busy working with metalformers keen on introducing automation into their operations, and MetalForming thought it would be a good time to tap Bisbee’s expertise and find out why hydraulic presses and robots can be an ideal fit. This horizontal-oriented hydraulic press teams with robots to feed and manipulate heavy, large aluminum blanks, and hold part material during a draw operation. With installation of this cell, a metalformer has increased productivity by 233 percent while saving employees from ergonomic risks related to manually manipulating the heavy part material. While robotic cellular manufacturing has been a popular trend in fabricating applications, more recently, an increasing number of hydraulic-press users have expressed serious interest. Affordability and easier-to-handle technology are major reasons why. This holds true across the different tiers, even reaching into ‘mom-and-pop’ operations, as robots become increasingly affordable to buy, program and run. Some can ROI-justify a full robotic press cell, while others with a lower capital-expenditure budget, can install a press now and have it wired and oriented to easily accept robotics down the line. Why Bring in a Robot? Simpler operation also can boost the pressroom-robotics trend. Key to programming ease are intuitive, smartphone-like user interfaces with real-world language, teach pendants, and even the ability to hit a ‘record’ button to save sequences that can include end-of-arm-tooling actions and robot-arm manipulations. The robot saves those movements to run again in the future, resulting in consistent, repeatable operations. “This can be done for many simple applications, such as unloading small parts or placing them here or there,” Bisbee says. “More complicated procedures involving multiple-axis movement and various in-press maneuvers require more intricate programming, but even that has become easier. We can see why robots are becoming more and more common in pressroom environments, and a complementary relationship between hydraulic presses and robotics can bring even greater benefits, according to Bisbee. Bisbee points out one current application where, during a draw sequence, the press communicates with the robot, instructing it when to enter the press to hold and extract a part. As the robot removes the part from the tooling, it communicates instructions to the press, telling it to move at a certain velocity and hold a certain ram position during extraction to help ensure proper part removal and the desired part orientation. “Often with a mechanical press, the ram descends, forms the part, ascends and then tells the robot to retrieve the part,” he explains. “The press and robot basically handshake on a discreet level. In the case of a hydraulic press and robot, they communicate on a much higher level to actively handshake and know exactly what the other is doing. It is very complementary. The recent installation referenced above speaks to the efficacy of a hydraulic-press/robot solution. The new $2.2-million cell features a horizontal-acting 750-ton Greenerd deep-draw hydraulic press assisted by two Fanuc multi-axis robots. Prior to the installation, several vertical presses performed five draws on 80-100-lb., 0.5-in.-thick aluminum blanks. Given the large and heavy blanks, Greenerd proposed automating the front end with a robot loading the horizontally oriented press. Prior to installing the new cell, explains Bisbee, the cushion would push the material part-way off of the tooling, then an operator would come in to manipulate the material, followed by another push and more manipulation—a time-consuming process that also required excessive manual reach and handling. “Now, after the draw, an unload robot holds the drawn part while the cushion ejects it,” he says. At this point, the robot essentially performs the same duties as employees had in the previous setup, but instead can maneuver material while the press ram opens and the cushion pushes, saving a large amount of time. This is where the robot and press communicate back and forth, with each taking direction from the other throughout. This process repeats for five draws, with dome-shaped parts created from the master blank. Whereas the metalformer had taken roughly a week to run 25 blanks through this process, now, with the new cell setup, that’s been cut to a day-and-a-half, a 233-percent increase in productivity. With the increase in productivity, the metalformer freed its vertical presses for more work while improving employee safety, according to Bisbee. One operator still assists with loading pallets of blanks and another with removing drawn-part pallets, and productivity gains have delivered new work, so no employees have been replaced via this automation. See also: Greenerd Press & Machine Co., Inc., FANUC America, Inc.
Now you can see Robots in everywhere now the hydraulic machine has also become the robots and they work automatically.